Good news, Xiaomi Mi Max/ Max Prime is getting the Latest updates, based on MIUI 8. This update started rollout very recently and the users have been notified via OTA (over the air). MIUI 8 v2.1.0 build for Mi Max/ Max Prime carrying all the latest features of MiUI 8 based on Marshmallow. We have also shared the guides to “Install MIUI 8 v1.9.0 Global Stable ROM on Xiaomi Mi Max Prime” and “Update Xiaomi Redmi Note 3 to MIUI 8.1.6.0 [Global Stable ROM]” previously. And here we provide you to download and Manually Update Mi Max/ Max Prime MIUI 8 V2.1.0 Global Stable ROM. If you have not received OTA notification nor you want to wait anymore for OTA updates, then follow this guide. Here you will learn the complete method to Manually Update Mi Max/ Max Prime MIUI 8 v2.1.0 Global Stable ROM. The MIUI 8 v2.1.0 for Mi Max/ Max Prime is a stable build all over the globe. Also, Mi Max/ Max Prime are the latest with pretty nice hardware specs. And I am sure that after updating Mi Max/ Max Prime to MIUI 8 V2.1.0 Global Stable ROM you will find some new and enhanced experience of MiUI 8 ROM. You can check the OTA updates from the device Settings -> About Phone -> System updates -> Check for update. However, here you can Manually Update Mi Max/ Max Prime to MIUI 8 v2.1.0 Global Stable ROM. follow the tutorial entirely, don’t miss any step. 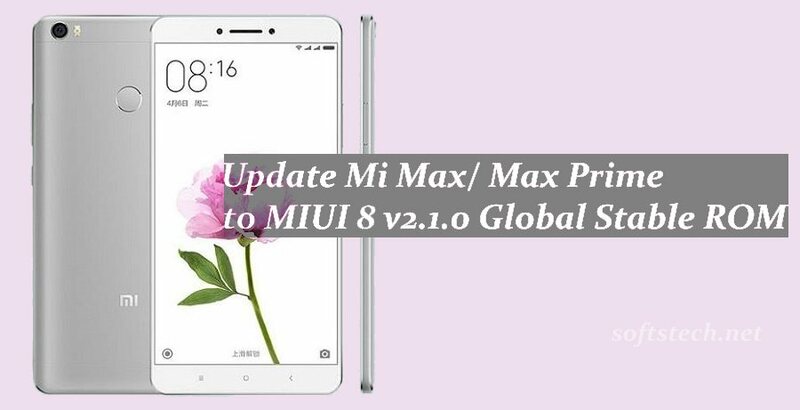 Important: This guide is advised only to manually Install Mi Max/ Max Prime MIUI 8 v2.1.0 Global Stable ROM. So, don’t try or flash on any other device. Also, proceed the whole process only at your own risk. We are not responsible if anything goes wrong with your device. Manually Update Mi Max/ Max Prime MIUI 8 v2.1.0 Global Stable ROM. Take a full backup of the entire data on Mi Max/ Max Prime before processing this guide. Also, make sure that the battery of Mi Max/ Max Prime has more than 60% charging level. Download the MIUI 8 v2.1.0 Recovery or Fastboot ROM for Mi Max/ Max Prime from the links above. In results, the process to download and manually Update Mi Max/ Max Prime MIUI 8 v2.1.0 Global Stable ROM will get successful. For further query do contact us.